m!ka Poles allow for additional flexibility. When it comes to mounting m!ka Monitor Arms or Accessories, m!ka Poles serve as a backbone. The poles are available in two versions: Either fix them to walls (Wall Mount Poles) or choose a 360° version (System Poles). According to your needs, we offer multiple options to mount poles to your desk, wall or ceiling to position your m!ka equipment wherever you wish. m!ka Pole Support. 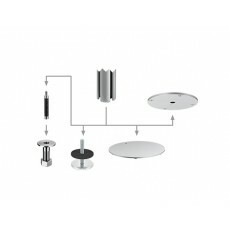 Your partner for the ideal m!ka System Pole mounting. m!ka System Pole Support offers you a choice of multiple ways to mount your m!ka System Poles. Choose between different options to mount them to your desk or ceiling.